My garden is full of rusted metal garden stakes. Their worn and weathered look is the perfect complement to nature's natural beauty. Our selection includes many wild and wonderful birds and other animals. 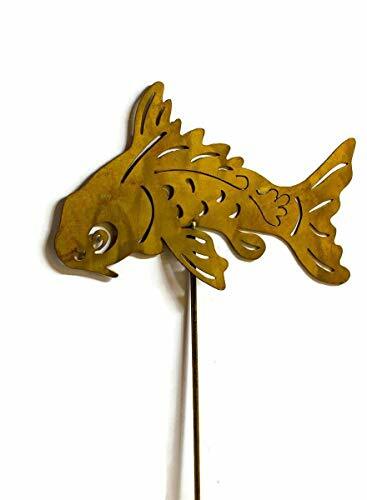 Rusty Koi Garden Stake. Every garden stake is hand cut and rusted for a lovely rustic and unique look, then protected with a clear top coat. Koi measures 16" long x 9" fin to fin and is mounted to a 24" stake. Instead of being a single feather, the quail's topknot is six overlapping feathers. They can often get by without water, getting what they need from what they eat. 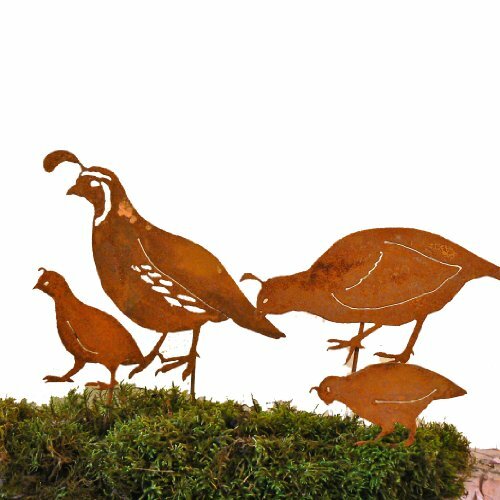 Enjoy arranging this quail family in your garden. Handmade in steel from an original design and hand-rusted. 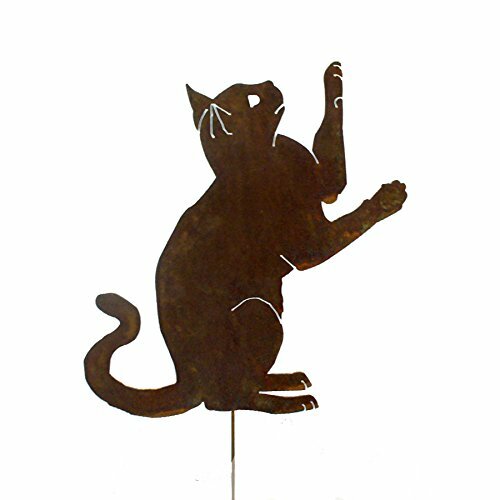 Individually mounted on a sturdy short stakes, these silhouettes are not just decorations for your garden or yard. Enjoy adding a one-of-a-kind accent to indoor planters or other interior design. SKU# S906 Dimensions: height 8.5 in., width 7.5 in. 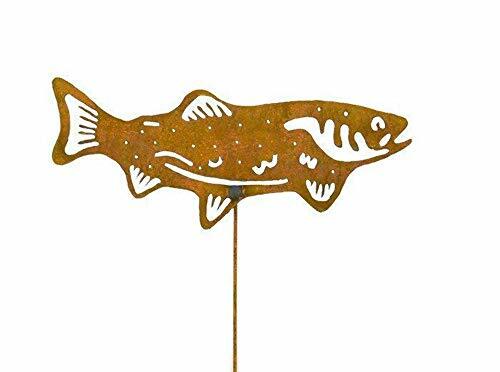 Wonderfully handcrafted metal salmon silhouette yard art for fishermen and nature lovers! Cut from steel, then put through a special process using organic products to produce a natural and earthy patina. The yard art is then coated with a protective sealant to preserve the finish for many years. The handcrafted elegance adds a subtle point of interest to planters, gardens, indoors or outdoors. Quick - catch this roadrunner before he dashes away! 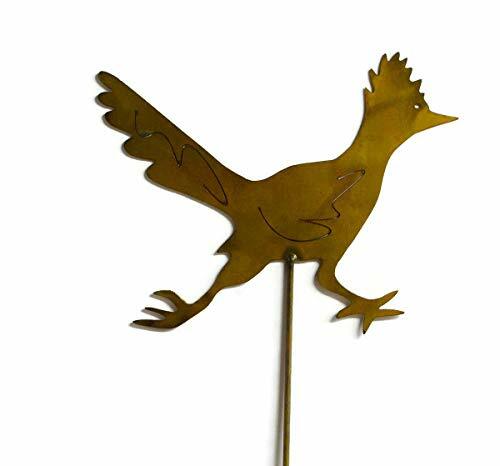 Roadrunner yard stake is hand cut and formed from steel with a natural rust patina. This bird garden stake is a beautiful and interesting addition to garden spots and planters, indoors or out. The roadrunner measures 12" x 9.5" and is mounted to a 24" stake. 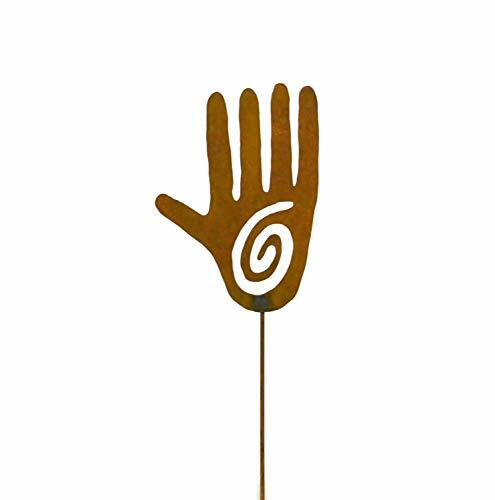 Healing hand, artisan crafted metal garden stake with a natural rust finish. Adds rustic whimsy and charm to garden spaces or planters. Makes a great gift for gardeners. Hand measures 7" x 10" and is mounted to a 24" stake. 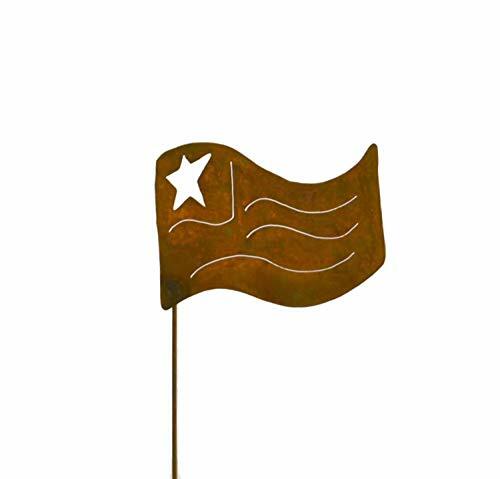 Wonderfully handcrafted metal american flag silhouette yard art for a patriotic touch to your landscape! Cut from steel, then put through a special process using organic products to produce a natural and earthy patina. The yard art is then coated with a protective sealant to preserve the finish for many years. The handcrafted elegance adds a subtle point of interest to planters, gardens, indoors or outdoors. 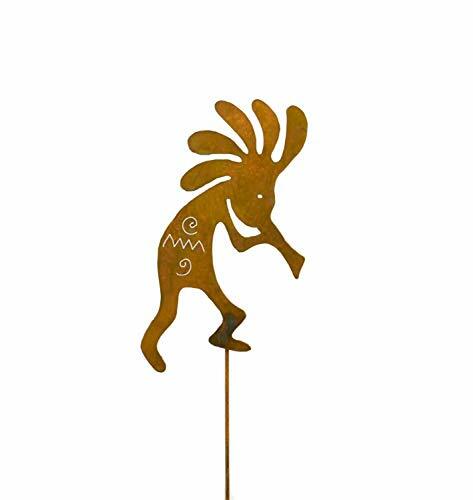 Wonderfully handcrafted metal kokopelli silhouette yard art for a southwest touch to your landscape! Cut from steel, then put through a special process using organic products to produce a natural and earthy patina. Adds rustic whimsy and charm to garden spaces or planters. Makes a great gift for gardeners. 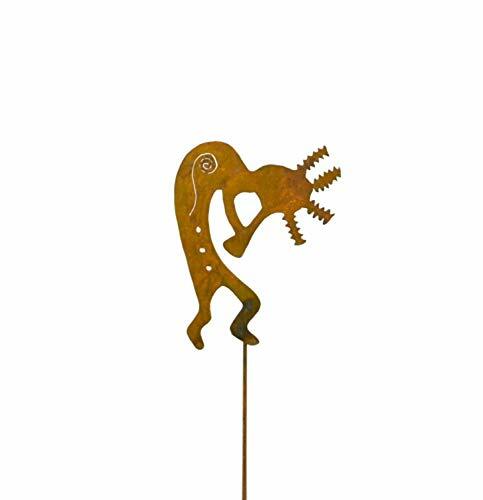 Kokopelli measures 7" x 10" and is mounted to a 24" stake. Artisan crafted metal garden stake with a natural rust finish. Adds rustic whimsy and charm to garden spaces or planters. Makes a great gift for gardeners. 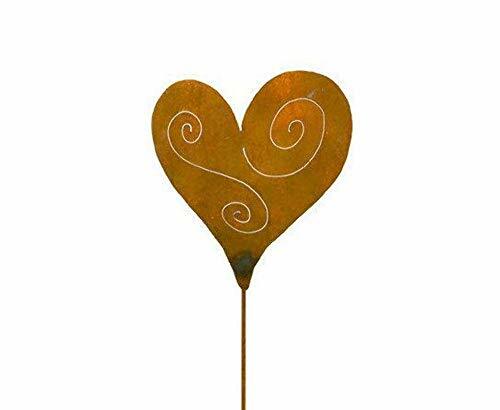 Heart measures 7" x 7" and is mounted to a 24" stake. The Kokopelli design measures 8"W x 12"H and is welded to a 24" long stake.Finished in a rustic patina and protected with a clear top coat. Artisan crafted metal garden stake with a natural rust finish. Rust will vary from gold to red, and will continue to rust over time. Rabbit measures 14.5" x 10" and is mounted to a 24" stake. This curious kitty looks at something intriguing over its head. Also available on a tab mount as #A203. Handmade in steel from an original design and hand-rusted. 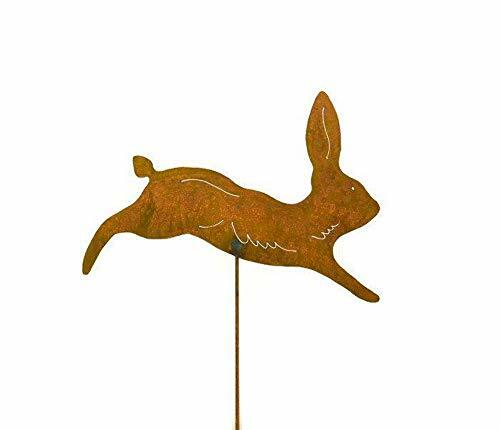 Mounted on a sturdy short stake, this silhouette is not just a decoration for your garden or yard. Enjoy adding a one-of-a-kind accent to indoor planters or other interior design. SKU# P429 Dimensions: 11.5 in. wide x 20.5 in. high.